That’s good stuff. Here’s another thought that might be personally life-changing. What if you dedicate a few minutes of reflection about the outgoing year and the important things you have experienced or learned? Spending time in reflection might sound airy-headed, but it I think it is simply a practice of wisdom. How can you truly learn about yourself if you don’t slow down and think about what has happened in life, what is good and not-so-good in yourself (and in life) AND what God is doing? If we all spend a few minutes thoughtfully reviewing the past year, we might learn something that will help us in the New Year. Choose a block of time that is realistic to you (5 minutes, 15 minutes, 2 hours, whatever is realistic for you). Grab a journal or open a document. When you are done, you will know yourself and God’s work in and through you better. It might even help you set your New Year’s Resolutions. Let me just say it: Many Christians are sinful voters. What on earth am I talking about? Let me explain. We intercessors then spend a lot of time praying that God will cause people (particularly non-Christians) to behave righteously. But can I make a Biblical point? II Chronicles 7:14 says: If MY people. It’s God’s people who need to turn from their wicked ways. I believe one of our wicked ways is: slothful voting. Slothfulness is laziness. We Christians are often lazy. We vote what we are told to vote. We have an *assigned party* and we vote party line without ever checking in (and truly seeking his face and listening penitently) with God about His opinions. Each major party has what I call a *golden carrot* that it dangles in front of it’s members to keep them voting with the party. This carrot is powerful and party members believe powerfully about it. For Democrats the golden carrot changes, but each election cycle the carrot is the one reason many people vote with the party. Right now the golden carrot is climate change. Republican party: Has there been any change toward pro-life legislation in 40 years? 40 years? Nope. Legislators often throw a weak bill into committee just to say they’ve done something or tack a regulation of abortion onto some other random bill knowing it will be dropped or the bill fail. But nothing meaningful. Democratic party: Is there lasting, powerful legislation about climate or the environment? Not really. Why is it that the golden carrot issues never get fixed? I believe that if legislators actually take action on these issues and the problem is solved, the *one issue* voters won’t need to stay with the party. Think about it. This is where our slothfulness as voting Christians comes in. What if God wants us to tackle these golden carrot issues in a more effective manner? What if the Holy Spirit has wisdom about these issues that we are not learning from Him because we don’t listen. We just vote the party line and forget about it. You know the AA definition of insanity: Doing the same thing over and over, expecting different results. 4. God is not a Republican…or a Democrat. He’s God. His ways are not our ways. What if we voting Christians become praying, seeking God, repenting of our laziness Christians? 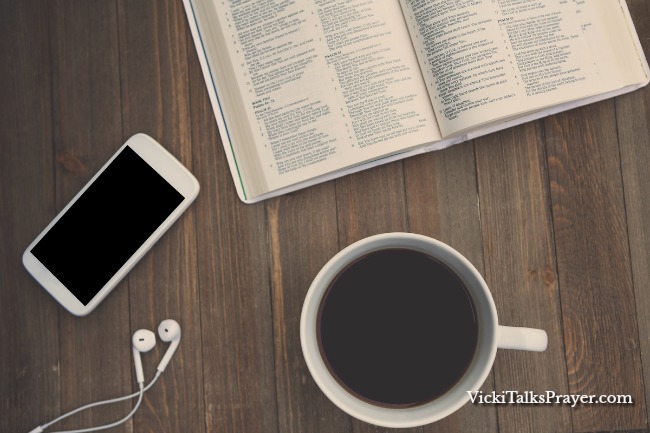 What if we open our hearts to God’s agenda, whatever that is? In II Kings 19, King Hezekiah was faced with a hopeless situation. Jerusalem was besieged by the Assyrians who had just sent him a letter with totally non-PC threats of what they were soon going to do the the city’s residents. Hezekiah had exhausted his options. The situation was hopeless. So Hezekiah tore his clothes in repentance, took the letter to the temple, spread it out before the Lord and prayed. This is what God wanted from Hezekiah. God sent the prophet Isaiah to him to let Hezekiah know that God was fed up with the Assyrians. In the morning, the king woke up to the news that an angel of the Lord had slain 185,000 Assyrians during the night and the rest had gone home. May I encourage you to seek God’s face, pray and turn from any sinful/slothful voting ways? Wouldn’t it be cool if we aligned ourselves with God rather than one party? Let’s see what He will do in our nation. I’ve been around a long time and learned a lot of things. Here is one thing I have learned recently: The world is not a better place. That generation of adults looked to my generation (the Boomers) with misty eyes, just knowing in their hearts that the wars they had fought and the economic despair of the Depression they had endured would be a thing of the past for our generation, or at least, our kids’ generation. The adults back then would talk glowingly about how our democracy gets better and better with each generation. They knew that we would live in peace and prosperity. They sacrificed so much to bring the hope of a better world to my generation. My generation is now nearing the hand-off to the present and future generations. And guess what? Egocentrism and lack of courtesy in everyday life. …unless you look at the things that may be more true than the evil and the not-better. It is true there is bad, but it is more true that there are people who take prayer, like I Timothy seriously. They pray. I imagine that in God’s eyes, these prayers are more important than the greed and corruption that perpetuate poverty and hopelessness, the wars and hatred. Maybe in God’s economy, there’s a different *currency* than money? Maybe *the world being a better place* is not the present goal for God, but us being the better people is most valuable. Maybe in God’s economy, a few humble, praying people are more valuable than a group of greedy politicians and businessmen who profit from being in power. …unless you look at behavior that may be more true than the evil and the not-better. Maybe what is most true is that there are a few people who show grace and courtesy, who live life according to Micah. He has shown you, O Man, what is good; and what does the Lord require of you, but to do justly, and to love mercy, and to walk humbly with your God. For instance, maybe the gracious act of the young man who courteously gave up his seat for me at an overbooked concert weighs more in God’s kingdom than the 3 young athletes and store employees that pushed in front of me during in my latest grocery store trip. I imagine that in God’s economy, 1 gracious young man is more valuable that 3 rude young people. God’s economy is SO upside down from ours. If we become better people, maybe we will seek God’s face before voting for any other greedy, bigoted, self-serving official to any level of government… Maybe God will give us wisdom to vote in wise and good men lead our local communities, states and nation. Maybe if we seek God’s face, we will find His grace to live our personal lives justly, mercifully, humbly…more of the world will know grace and courtesy. I’ve learned a lot of things over the years. One is that the world is not a better place. I hope I will live closer and closer to that humble, God-seeking person He created me to become. I hope the same for my nation. However, that’s what I need to talk about: Christian responsibility to the nation in light of Scripture. This is not about guilt: we can’t be perfect followers of Christ. (Few of us have time to move to a monastery and spend our days totally devoted to prayer and fasting.) However, we live in a day, where we Christians could seriously up our game. We have responsibilities. There are mid-term elections coming up. We should definitely use our voices in casting our votes. Even more important, we need to is to get our priorities straight. If we do so, when we vote, we’ll hopefully have not only voted our conscience but also God’s will (rather than voting our political party’s conscience or social media’s pressure). Seriously. Pray for our nation daily. No matter what we think about the people in charge of the nation, we need to pray for them to follow God’s directives, not their own greed, lust, confusion, or political pressures. We also need to pray for all people (not just *me and mine*). What would happen if Christians truly prayed for all people, for leaders, for authority figures: that they follow God’s wisdom, guidance and goodness? What if we prayed for them to live in truth, to fulfill God’s mission (rather than their own)? Can you imagine a nation where the people, leaders and authority figures lived like that? This means to do what is right and just toward people and God’s creation. The word *justly* here is *mishpat*, which can be translated as *good deeds*. This means to place high value in mercy. The Hebrew word for *mercy* is *chesed*, which connotes having loving-kindness toward people; and reverence and respect towards God. Remember, we have the warning that pride goes before destruction and a haughty spirit before a fall. (Proverbs 16:18) We need to live with the consciousness that God is with us and attentive towards us. What would humility look like if we really believed that the God of the universe was watching us? What if we genuinely walk 2 Chronicles 7:14 with clear mind and conscience? What could God do through us and in our nation if we got the party pressures, social media pressures, peer pressures out of our hearts and concentrated on what God wants to do? I’m praying daily for my nation. Want to join me? I’m going to work on justice, mercy, humility, seeking God’s face and turning from my own wicked ways. Want to give it a try? Let’s see what God wants to do! I am starting a Facebook group for praying for our nation. I am endeavoring on Monday mornings to FB live a prayer for the nation for others to watch or join, plus a daily prayer for the nation. I will do this until the midterm elections, and if God leads, longer. Would you like to join me there? 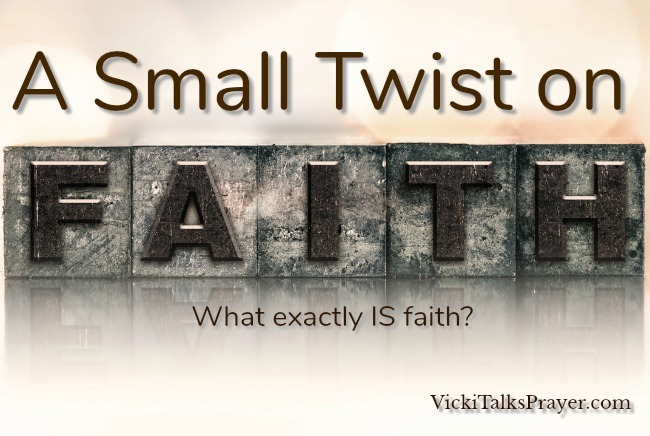 Faith is a multi-faceted thing, don’t you think? In my many years of religious experience, I’ve had lots of opportunities to be educated about what *faith* is. Can you relate to any of these? When I was a child, I was in a denomination that only used the word *faith* in the phrase *saving faith*. Once I had confessed that I was a sinner and believed that God raised Christ from the dead (accepted Christ’s sacrifice), I had a saving faith. That was cool, but eventually I needed *faith* to be more than insurance against hell. I had some learning time in a fundamentalist denomination where not only do you receive a saving faith but you learn that faith cometh by hearing and hearing by the word of God (Romans 10:17 KJV). Respect for Scripture and eagerness to learn about God through His word was strengthening to my faith, but it seems to me that faith is more than that. Then I had some fun but name-it-and-claim-it… or *Word* churches. They took a totally different view about God. This *faith* was about God looking out for US. In a harsh and uncaring world, I found it a great relief to know that God loves me and cares about the minutiae of my life. This kind of faith taught that Scripture knowledge was the door to growing faith so that I could know God better and be rewarded by receiving what we will. After a while, I got tired of it. However, I do believe that faith is a thing that grows. It is fed by knowing who God is, by loving Him, and by time with Him. My faith tells me God cares about all the parts of my life. But I wanted more. 11 And it came to pass, as he went to Jerusalem, that he passed through the midst of Samaria and Galilee.12 And as he entered into a certain village, there met him ten men that were lepers, which stood afar off:13 And they lifted up their voices, and said, Jesus, Master, have mercy on us.14 And when he saw them, he said unto them, Go shew yourselves unto the priests. And it came to pass, that, as they went, they were cleansed. 15 And one of them, when he saw that he was healed, turned back, and with a loud voice glorified God,16 And fell down on his face at his feet, giving him thanks: and he was a Samaritan. It seemed to me that Jesus was appreciating the leper’s gratitude. 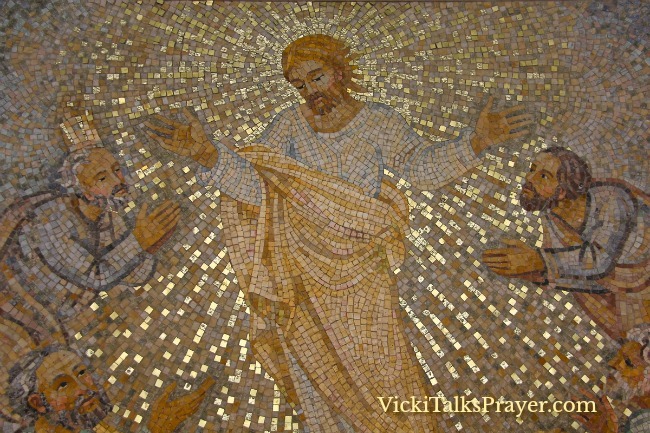 Jesus was connecting faith and gratitude and healing for the leper. What this story said to me is that gratitude is a KIND of FAITH. Luke 17 affirmed to me what I’ve already been experiencing. As a prayer discipline, I’ve been keeping a daily written gratitude list for about a year now. As I’ve noted the big and small things that I have to be grateful for, it has helped me calibrate my soul with the way that God does things. This has, I believe, given me a deeper and quieter faith. 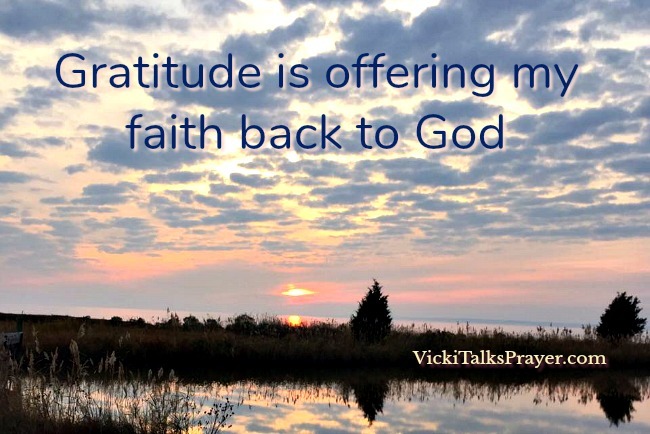 I had never thought of faith and gratitude as being interconnected. It was a *twist on faith* for me. What have you discovered about faith? What helps your faith grow?